Why is it difficult to transfer contacts from iPhone to Android? iOS and Android are the two most popular cellphone OS today. But they run on different platforms. You cannot pair an iPhone and an Android phone via Bluetooth or other ways. Suggestion: Use one cloud account on all your phones all along, like Gmail/Google account. In this way, the problem will be avoided. Contents below are merely remedies. Back up iPhone contacts to iTunes, then sync contacts from iTunes to Google contacts, finally set up Google account on Android. Step1: On your computer, run iTunes, then connect iPhone to computer via USB. Step2: Click iPhone icon on iTunes to open settings. Step3: Go to "Info" option, tick on "Sync Contacts with", choose "Google Contacts" from the drop-down menu. Step4: Enter your Google user name and password, click "Apply" to start syncing. Step5: On your Android phone, go to "Settings"> "Accounts"> "Add Account", choose Google account, then set up and log in your Google account. 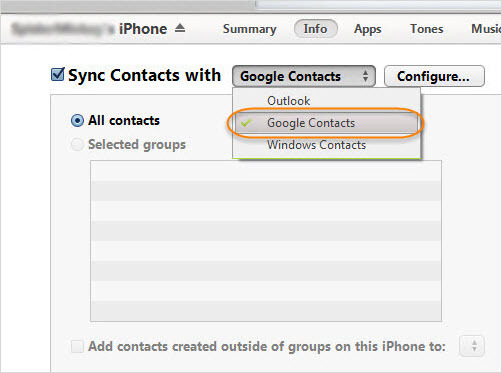 Step6: On your Google account, enable it sync "Contacts" if the sync is turned off. Note: Check whether your contacts are on your Android Contacts now. 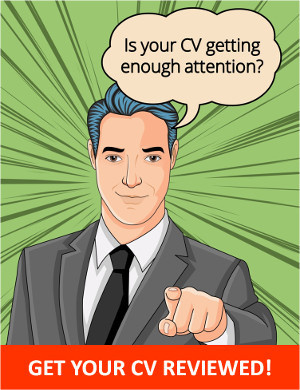 If not, try to set up Google account on your Contacts app. Export iCloud contacts as VCF file, then move the file to your Android and import it, or import it to Gmail. Step1: Enable iCloud service on "Settings" on your iPhone, and back up contacts to iCloud. Step2: On you computer browser(Firefox is recommended in order to complete following steps smoothly), go to https://www.icloud.com and sign in with your account. 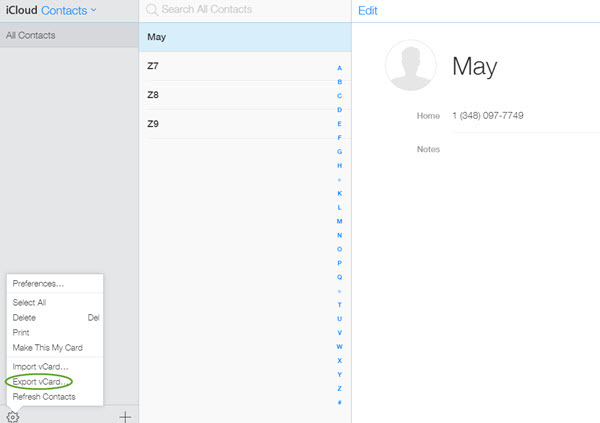 Step3: Click "Contacts" at iCloud start page, then you will be shown with all your contacts that have been synced to iCloud. Step4: Select the contacts that you want to transfer. Step5: Click the gear wheel icon at the lower left and select "Export vCard...". Step6: Your contacts will be downloaded as a VCF file to your computer. Step7: Send the VCF file to your Android phone and import it. Or you can import it to Gmail. Note: The VCF file will not be downloaded on Chrome or IE. You should use Firefox for this. 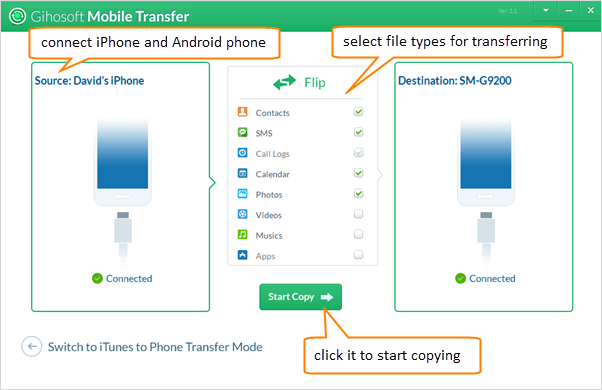 Gihosoft Mobile Transfer allows you to transfer contacts either from iPhone to Android or from iTunes backup to Android by several clicks. Step1: Download and install Gihosoft Mobile Transfer to your computer. Step2: Run the software and connect two phones to computer via USB cables. Step3: Choose Contacts data, then click to start transferring.